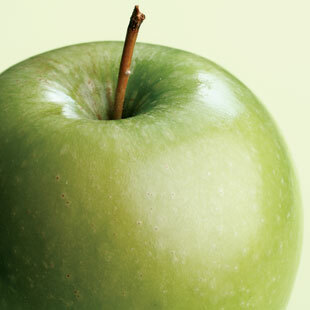 A new study shows apples may protect against metabolic syndrome. Can eating an apple help protect you from metabolic syndrome—a cluster of symptoms related to an increased risk of heart disease? It’s possible, say researchers who analyzed data from the 1999-2004 National Health and Nutrition Examination Survey. In the survey, people who reported consuming any form of apples within the past day were 27 percent less likely to have symptoms of metabolic syndrome—like high blood pressure or a waist measurement of over 40 inches (for men) or 35 inches (for women)—compared to those who didn’t. The apple eaters also had lower levels of C-reactive protein, a marker of inflammation whose presence in the blood suggests an increased risk for heart disease and diabetes. While a one-day snapshot doesn’t represent a long-term dietary pattern, the study shows that eating apples “is associated with broad metabolic advantages,” notes lead investigator Victor Fulgoni, Ph.D. This study adds to a growing body of evidence indicating apples benefit the heart. Last year, the Iowa Women’s Health Study reported that, among the 34,000-plus women it’s been tracking for nearly 20 years, apples were associated with a lower risk of death from both coronary heart disease and cardiovascular disease. Some years earlier, Finnish researchers studying dietary data collected over 28 years from 9,208 men and women found that frequent apple eaters had the lowest risk of suffering strokes compared with nonapple eaters. What explains the hearty benefits? Researchers suggest that the strong antioxidant flavonoid compounds found in apples—quercetin, epicatechin, epigallocatechin, kaempferol and other polysyllabic wonders—play a key role by preventing LDL cholesterol from oxidizing and triggering a series of events that result in the buildup of plaque in arteries, as well as inhibiting inflammation. “But antioxidants are just one piece of the whole puzzle,” notes Cornell University food scientist and apple expert Rui Hai Liu, Ph.D. Apples are also rich in pectin, a form of soluble fiber known to help lower cholesterol, and they provide a decent amount of vitamin C, another antioxidant. Bottom line: Enjoy apples in all their forms—applesauce and juice (look for brands labeled “made with whole apples,” recommends Liu) and especially apples in their simplest, whole form. Be sure to leave the peel on—and not just because that’s where much of the healthy phytochemicals are concentrated, but for apples’ full flavor complexity.